Two new studies into aspects of wage payments in Australia, and the repeated call by the Governor of the Reserve Bank of Australia, Philip Lowe, for higher wages, create an opportune time to discuss wages from a Marxist perspective. That perspective requires us to go beyond the surface phenomena of wages and to understand why Marx, sounding at first like a grumpy old industrialist, called for scrapping the slogan: “A fair day’s work for a fair day’s wage”. After all, that is what motivates union activism and is the cornerstone of much of what passes as progressive politics. We will look further down at why Marx rejected the “fairness” of the slogan. We highly recommend Humphrey McQueen’s 150 Years Young: Marx’s Capital , available to readers as a downloadable pdf on our website, for more on this topic. First, let us note that amongst the many contradictions of capitalism is the one that compels individual capitalists and corporate CEOs to try to keep the wages of their own workforce as low as possible, while requiring the workforce as a whole to have expanding wages in order to absorb through consumption those goods and services which provide the capitalists with their profits. Lowe wears two hats: as the head of the financial industry in Australia and as CEO of a particular, if central, component of that industry. In the former case, he said last June that workers should demand “wage justice”, a call repeated last week when he pointed the finger at employers for Australia's extraordinarily low growth in wages, saying they are not paying more despite the tightening jobs market. This was Lowe looking at this from the perspective of the capitalist class as a whole – worrying about the sustainability of profits, of bank loans and the housing market. In between June and November, Lowe granted Reserve Bank employees average pay rises of just 2 per cent a year over the next three years - below the current rate of inflation and Treasury forecasts of inflation. Workers who are meeting all the expectations of their role could still see their pay go backwards in real terms under the new RBA workplace agreement. This was Lowe as a corporate CEO trying to contain the same costs that he accused other employers of trying to contain. Dr Lowe said he wasn't "calling on the workers of the world united to rise up against the evil capitalists”. He was trying to say that it was okay for wages to grow a bit more quickly – just not in his bank! 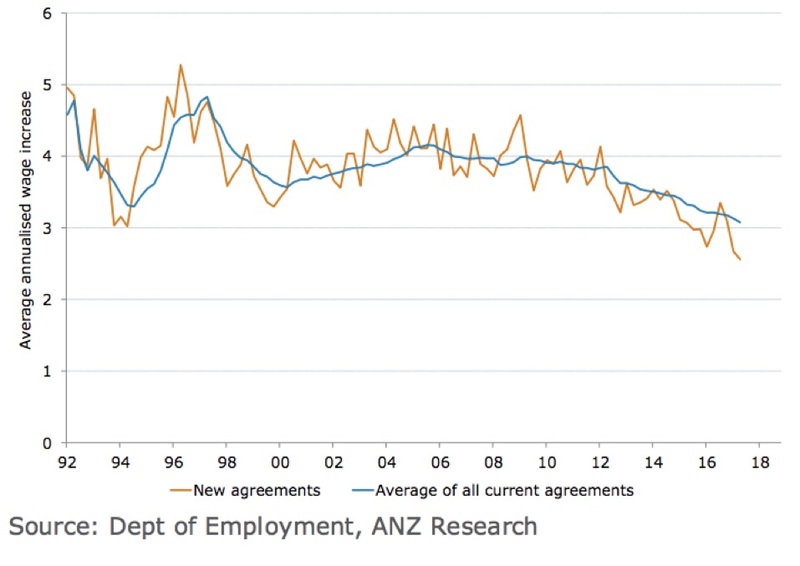 The graph shows that since 2008, wage increases under new agreements have been below those contained in agreements that were current at the time new ones came in. Other evidence of the current decline in wages comes from the Australia Institute’s Excessive Hours, Unpaid Overtime and the Future of Work: An Update, and a paper by two NSW academics for the Migrant Worker Justice Initiative, Wage Theft in Australia. Both papers provide quantitative data on the deterioration of wage levels in Australia. Not surprisingly, those polled for Excessive Hours… provided evidence of ongoing polarisation between those with full-time, relatively secure jobs, and a growing portion working part-time, casual, temporary, or insecure positions. On average, full-time workers gave 6 hours of unpaid overtime per week to their bosses; part-time and casual gave 3.3 unpaid hours per week on average. This “time theft”, as the authors call it, has an estimated value of $130.7 billion in 2016-17, an increase from the previous year’s $116 billion. The “breadth, depth and complexity of non-compliance with Australian labour law” is acutely felt among the 900,000 temporary migrants with work rights in Australia according to the Wage Theft…study. These include international students, backpackers and s457 visa holders. Together they comprise about 11% of the Australian labour market. All are required to be paid minimum wage rates by law. A substantial proportion (detailed figures by employment area, ethnicity, migrant status etc are given in the report) were paid around half the legal minimum wage. Most people would know that for Marxists, wages are a mask for exploitation. And for most, this simply means that the wages are “unfair” by being too low or earned because of excessive demands on the time of workers or through harsh intensification of the work to be performed. Wage Theft… offers a definition of exploitation along those lines: “exploitation means an employer’s use of workplace practices that are coercive, criminal, or constitute serious breaches of Australian labour law, in order to benefit the employer”. Marx, however, offers a radically different concept of exploitation, one that sees exploitation embedded in every purchase from the worker of his or her labour power by the employer, regardless of how high or low the wage, safe or unsafe, tiring or relaxing, long or short the conditions for the performance of the work. Paradoxically, that concept of exploitation is based on what Marx called an exchange of equal values. If the employer pays the worker enough to cover his/her cost of living and the worker creates values equivalent to that in the production of saleable goods or services, then there has been an equal exchange of values. However, the worker enters into a contract with the employer to work, say, for 8 hours a day. It may only take 3 or 4 hours to create the value of his/her wage in products. The remainder of the time at work is time in which the worker produces more than the value of what has been paid in wages: upon its sale, the employer takes that value, surplus to the exchange of equal values, as profit. On this basis, a person may be paid a high wage in a comfortable work environment and cover his/her own costs in an hour, working the remaining seven for nothing. Here the rate of exploitation is very high. Conversely, a low wage worker may find it hard to cover his/her own costs in seven hours and really only contributes one hour of labour power to the surplus value taken by the employer. Here the rate of exploitation is very low. If this seems to stand logic on its head, then it does so only to the same extent that pre-Copernicans thought Copernicus a liar and heretic for claiming that the Earth was not the centre of the Universe and that the Sun did not circle it. The Sun quite obviously rose in the East, travelled across the surface of the Earth and sank in the West. How could there be logic in the theories of the crazy Polish scientist? All of the matters that have emerged in the studies above (the extension of the working day, the intensification of the work routine, the just-in-time employment conditions of contract and part-time employees, the non-payment of overtime, the payment of wages below legal minimum levels and so on) relate to the employers’ need to reduce the amount of time the worker spends on the equal exchange of values with the employer and increasing the amount of time spent producing surplus value. For Marx, exploitation was not a moral judgement, but a mathematical relationship between the two types of time hidden behind the mask of the “indivisible” working day. Swindling - that is, not even allowing the worker to earn enough to cover living costs – denies even the exchange of equal values and is exploitation of a special type. Swindling is particularly in evidence in the industries covered in the Wages Theft…study. Be it exploitation or be it swindling, Marx could not conceive of a situation where there was “a fair day’s work for a fair day’s wage” in the capitalist economy. There was always the unfair and unjust fact of the capitalist economy requiring the theft from the worker of at least part of the time he or she was at work, and thus, of part of the value created by the worker in that time. That theft arose solely from the private ownership of the materials, tools and processes used to create goods and services – commodities - for sale. If that private ownership could be abolished then the surplus values need no longer be privately appropriated by a handful of rich and super-rich capitalists, but socially appropriated as a revenue stream for the benefit of all productive members of society. The replacement of a society run by and for capitalists, where exploitation always exists in the relations between labour and capital, by a society run by and for the workers and where there is no basis for exploitation, is the promise of socialism. In Australia’s case, the first socialist measure is the winning of anti-imperialist independence. Smashing the power of the biggest, best-organised and most powerful section of the ruling class, the section which comprises the imperialists and their hangers-on, will facilitate the further expansion of the socialist economy and remove wage-slavery from the equation.